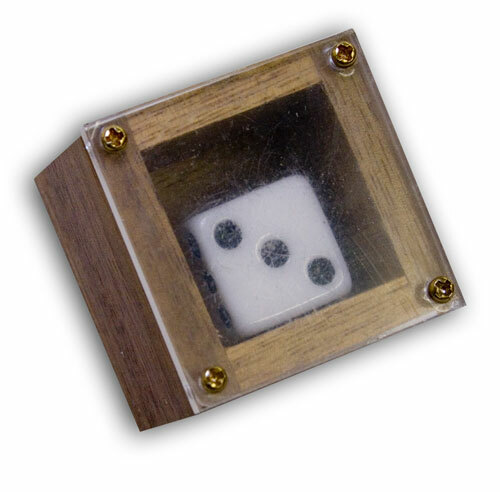 The performer displays a small wood box with a die sealed inside. The die can be seen through the clear acrylic top. A wonderful and colorful story about Jim Bob begins to unfold. Sadly, he lost EVERYTHING on the roll of this very die! A spectator is asked to try and change the uppermost number on the die by shaking the box, which he soon finds is impossible. The performer then asks the spectator to choose a number between 1 and 6. "If you were Jim Bob, which number would you have choosen?" The box is simply pushed toward the spectator and sure enough the uppermost number now matches the spectator's selected number! Any number may be used!. Can be examined before and after.